Comments: Eastern red bats are solitary, spending the day hanging like leaves from tree limbs. They rarely roost together except for a mother and her young. Males are orange-red and females are chestnut. They forage over fields and water in early evenings and swoop for insects around lights after dark, consuming up to half their weight each night. They migrate in late summer and hibernate in caves, hollow trees and buildings during the winter. Females have one litter of 3-4 pups usually born in June. Their maximum lifespan is 12 years. Distribution: Eastern red bats range from South America to the southern border of Canada. They are found throughout Kansas. 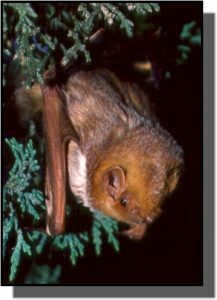 Food: Eastern red bats feed on flying insects, including small moths, beetles, and bugs.